Throughout her childhood, Jasmine was very interested in robotics, mechanics, and aerospace studies. She planned one day to enter the field of engineering, and during high school was involved in the robotics club, and the math team. 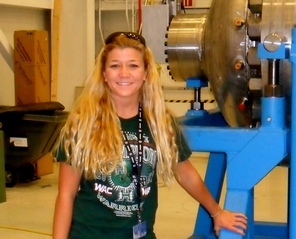 After graduating, she began a fellowship with NASA working on developing rockets and designing scientific payloads. She later joined the NASA COSMOS project, working on designing satellites. Her future goal is to design jet engines. She hopes to obtain a job working with Lockheed Martin, Boeing, or General Electric. The objective of this project is to design, develop, and test an airworthy magnetic-gear-based gearbox for utility actuation winch applications. We have designed and built two carts to hold the magnetically geared winch system and provide variable loading to it for testing purposes. The test cart configuration will consist of two physically separate carts, one for the winch and one to provide a load. Each cart will consist of its own specifically designed steering mechanism for each individual cart. The first rover cart is designed to securely hold the gear system that weighs approximately 300 lb. The steering system on the first cart functions like a wagon. This particular system allows us move the cart from different locations for testing purposes. The second cart was designed to carry a 1600-lb load. The load cart provides a flat platform that will allow us to have access to shift the weight plates. This particular cart was very difficult to integrate because of the amount of weight it must carry. Testing the magnetic winch’s capability will allow us to visually see the efficiency of this gear system.